I took a drive downtown yesterday to see the river and what it’s doing to the Western edge of the city. 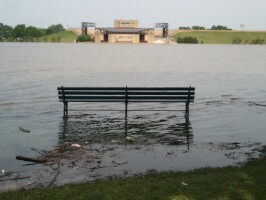 This photo was taken near the Visitor’s Center near the bottom of Jefferson Ave at Riverside Dr. If you were to head South from this point you would have been stopped by barricades at Union Ave which stretch past Beale. Between those two points the water was past the street and edging towards the little berm of land between the street and the railroad/trolley tracks. It was past that point as you get closer to Beale. The Riverboats were docked just off of Riverside. It’s usually a lengthy sloped walk to the boarding gangplanks from the street but they were close enough that you could take 7-8 steps and be on board. They say the river is supposed to crest today at over 48 feet. The last time it was close to this was back in 1937. That flood killed 500 people and covered 20 million acres of land. I heard today that is almost the size of the state of Virginia. The picture above is looking West towards the Mud Island Amphitheater. It’s hard to see in the photo but there is a wall just behind the stage that is about three and a half feet tall. The water was about 1/2 foot below that wall, once it goes over it will flood the stage and seating area. More photos can be found on the CNN site here.